Denise Llewellyn Executive director of nursing, Aneurin Bevan University Health Board Headquarters, St. Cadoc's Hospital, Caerleon, South East Wales. This is the first in a series of eight articles providing information about the Nursing and Midwifery Council (NMC) revalidation process, which was introduced in April 2016. This article focuses on setting up an online NMC account, preparing for revalidation and understanding revalidation requirements. Revalidation is a mandatory process for nurses and midwives, enabling them to demonstrate their ability to practise safely and effectively. Registered nurses and midwives are required to revalidate with the NMC every three years. 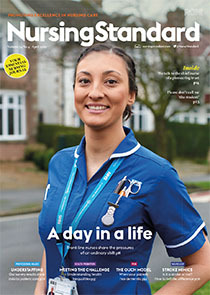 Revalidation encourages nurses and midwives to stay up to date in their professional practice. The strengths of revalidation compared to post-registration education and practice requirements. The revalidation requirements and how these can be met. Subscribers can upload their reflective accounts at: rcni.com/portfolio. This article has been subject to external double-blind peer review and checked for plagiarism using automated software.